Welcome to the Central Florida Multi Million Dollar Home Showcase. Here you can Search Multi Million Dollar Homes for Sale in FL. Find Multi Million Dollar Real Estate Listings including Multi Million Dollar Bank Owned Homes, Multi Million Dollar Foreclosures & Multi Million Dollar Short Sales. 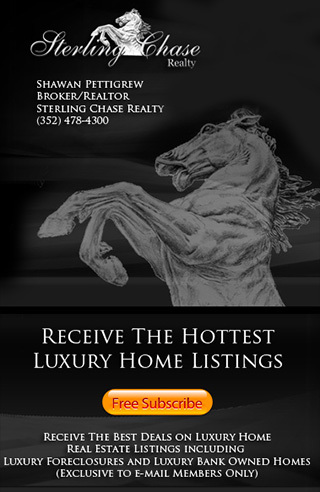 Sterling Chase Realty Specializes in Florida Luxury Homes and Multi Million Dollar Estates. For a private tour of or to learn more about these amazing homes call us at (352) 478-4300. This Page is updated daily so you are sure to see the latest Multi Million Dollar Real Estate information.